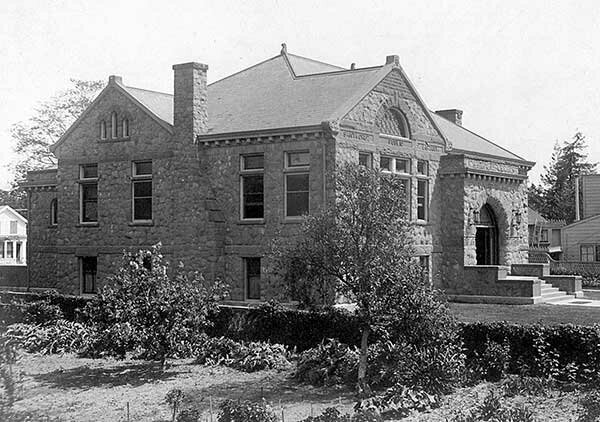 Santa Cruz library history dates from the 1868 incorporation of the Santa Cruz Library Association by a group of thirty men. They set out to build a collection, including public documents solicited from U.S. Senator Cole, and the library opened in 1870. Local women formed a Reading Room in 1874 and the two combined in 1876. From the beginning, locations were many and varied. Carnegie funding was sought and $20,000 was granted in 1902. An architectural competition brought plans from Burnham and Bliesner of Los Angeles, W.H. Weeks of Watsonville, Hoen of Sacramento, Skidmore and Schroeffer of San Francisco, and J. Marquis of Santa Cruz. Put on public display, the Skidmore plans were the public favorite, but the board chose Weeks. He designed the building in the Richardsonian Romanesque style. The builders were McPhee and Sutton from San Francisco. The cornerstone was laid September 29, 1903 and the building opened April 14, 1904. It was only slightly damaged in the 1906 earthquake. A notable event was the visit of Andrew Carnegie on March 11, 1910. 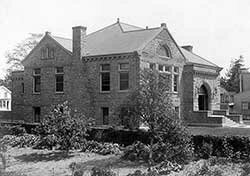 The building was already crowded by 1913 when additional Carnegie funding was obtained for branches. In 1966 the building was demolished.